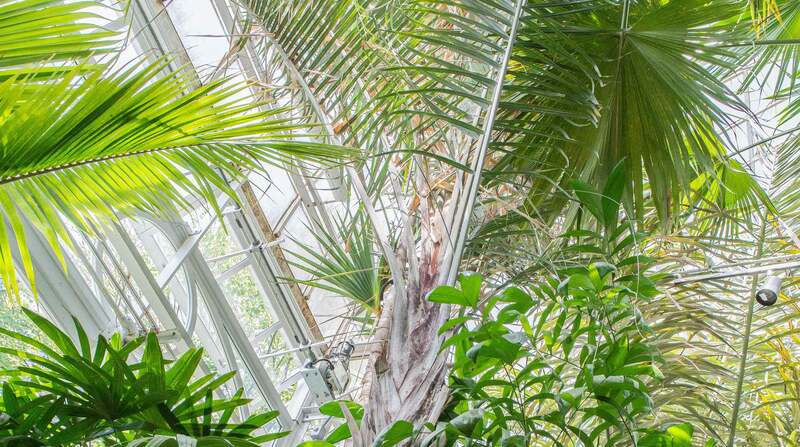 Beyond serving as a showcase for ever-changing seasonal flower displays, Phipps Conservatory and Botanical Gardens is also home to a number of renowned permanent collections — from ornate orchids and frilly ferns to princely palms and curious cacti. Take a look at some of our most prized specimens. 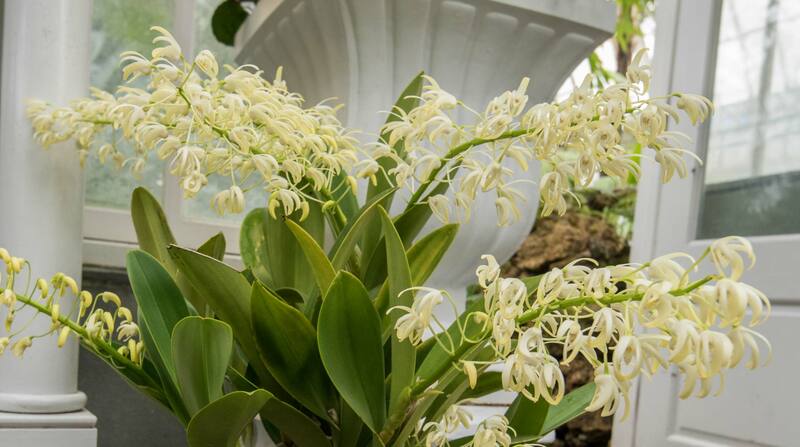 Outstanding blooms and fragrant flowers are on display year-round in our Orchid Room. While some or our orchids are specimens of true species, our collection also boasts an abundance of eye-catching hybrids. In 2018, the National Capital Orchid Society recognized two of Phipps’ slipper orchids with honorary awards. Phipps’ 2018 Orchid Society of Western Pennsylvania exhibit received a best-in-class award, with 16 other individual Phipps plants also winning awards. 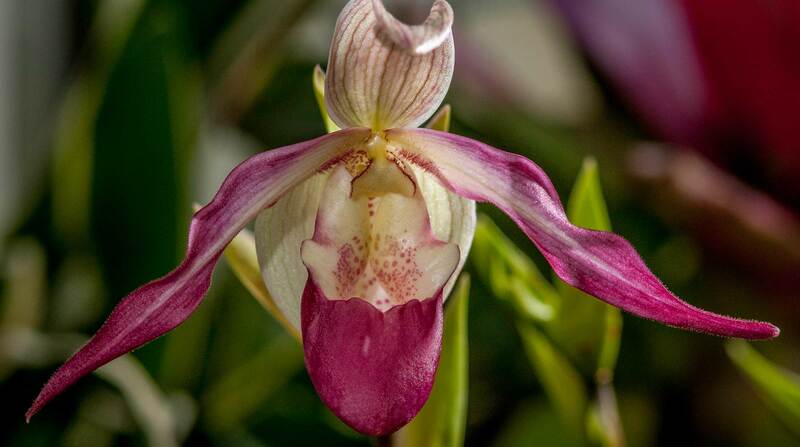 Phipps’ renowned Barbara Tisherman Slipper Orchid Collection, curated in collaboration with Orchid Society of Western Pennsylvania, is one of the most definitive of its kind. The collection is accredited by the Plant Collections Network, offered by the American Public Gardens Association and the USDA Agricultural Research Service. Orchids of this group are characterized by a lower petal, known as a lebellum, shaped like a slipper. One of our collection specimens, a Paphiopedilum gratixianum featuring eight white, purple and chartreuse flowers on 47-centimeters-tall inflorescences, was awarded a Certificate of Cultural Merit from the American Orchid Society in 2015. Another, the Borneo native Paphiopedilum sanderianium, has petals over three feet long; although it was lost in cultivation for a time, it was rediscovered in a wild population by Ivan Nielson in 1978 in Gunung Mulu National Park. 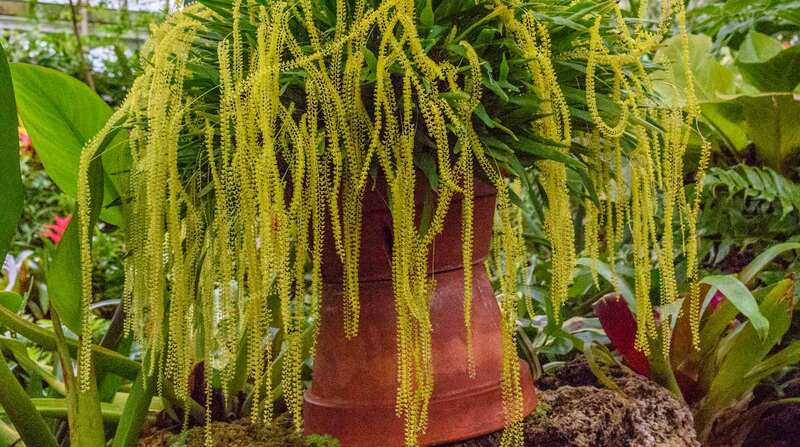 Dendrochilum orchids are commonly called golden chain orchids, for their long, pendulous flower clusters of yellow, cream or reddish hue. The genus includes dozens of species, many of which were discovered by the Dutch botanist Johannes Smith in Borneo and around the Philippines. Our collection includes several varieties of this unusual orchid group. 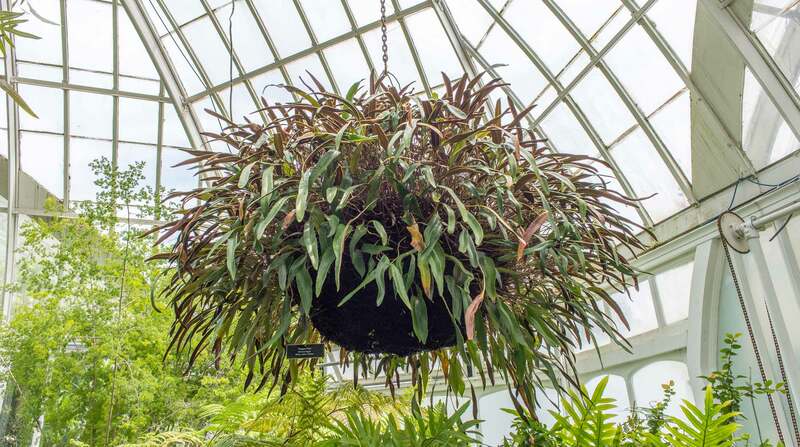 Dendrobium speciosum bears large, bulb-like organs called psuedobulbs that can grow up to 16 inches around. It is not uncommon for plants of this species to have over 100 blooms at once. In the spring you may see our Renanthera ‘Red Dragon’ orchid. While many orchid genera contain more than 1,000 species, the renanthera genus claims only 15. 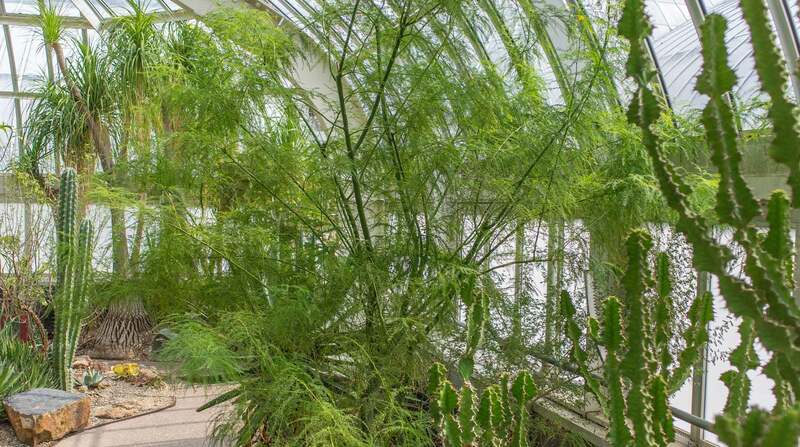 At over six feet tall, our specimen is one of the largest in our collection and must occasionally be cut back to prevent it from pressing on the roof. Bulbophyllum is the largest genus of orchids, with some sources listing over 2,000 species. Though some species of orchids bloom for months at a time, many types of bulbophyllum bloom for only a day or two, making their blossoming an event here at Phipps. One remarkable species, pictured here, is the Bulbophyllum phalaenopsis. 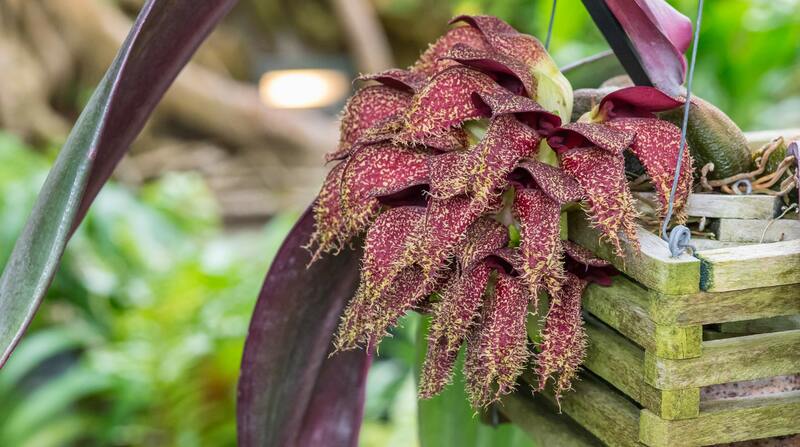 This orchid’s leaves can grow to be over three feet long, and much like the infamous corpse flower, its bloom attracts flies for pollination by emitting an odor reminiscent of rotting flesh. In autumn, orchids belonging to the cycnoches genus come into bloom. Native to the jungles of South and Central America, these orchids possess a mechanism that ejects pollen onto the bodies of insects who alight to feed on them, thus ensuring the visitors’ aid in the pollination process. Like many other varieties of orchid, our vanda orchids are epiphytes that appear as if they are merely bundles of roots, growing on trees rather than the ground and deriving their moisture and nutrients from the air and rain. 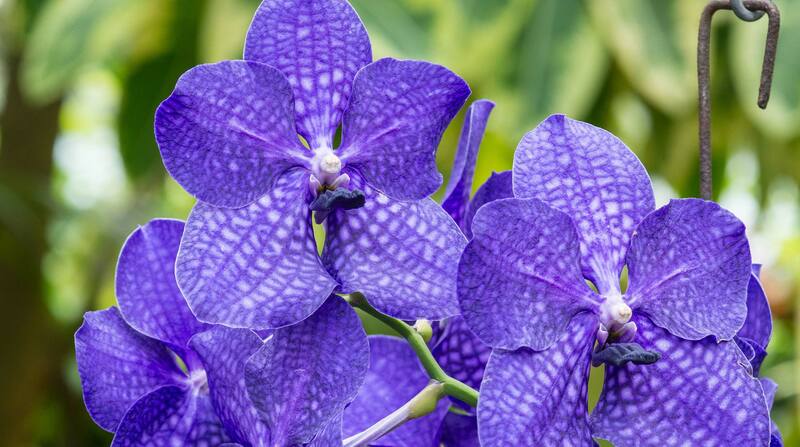 Vandas can be difficult for the home gardener to grow because of the high amounts of humidity these orchids require. 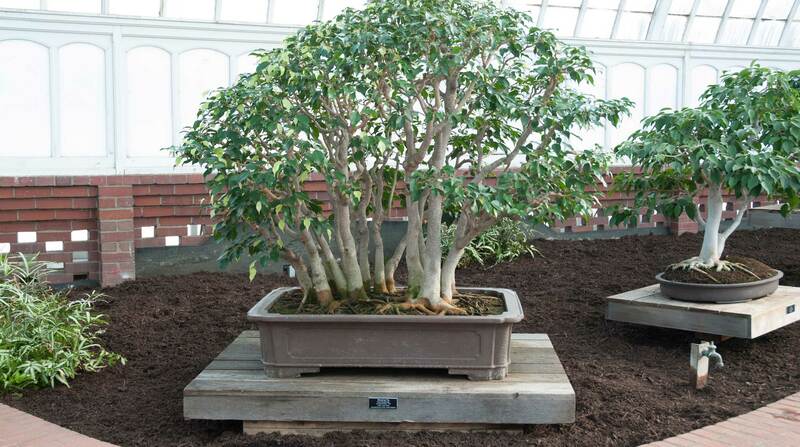 Bonsai, literally “tray planting” in Japanese, has been practiced for more than 1,000 years. Practitioners of the art cultivate plants in containers, using techniques such as pruning to dwarf and train the specimens into ornamental shapes. Classified by size and style based on the shapes of their trunks, roots and branches, bonsai take many forms, from the iconic formal upright bonsai to the more dramatic “slant” bonsai that resemble windswept trees. Our collection of these living artworks has long been a guest favorite. Silverberries (Elaeagnus spp.) 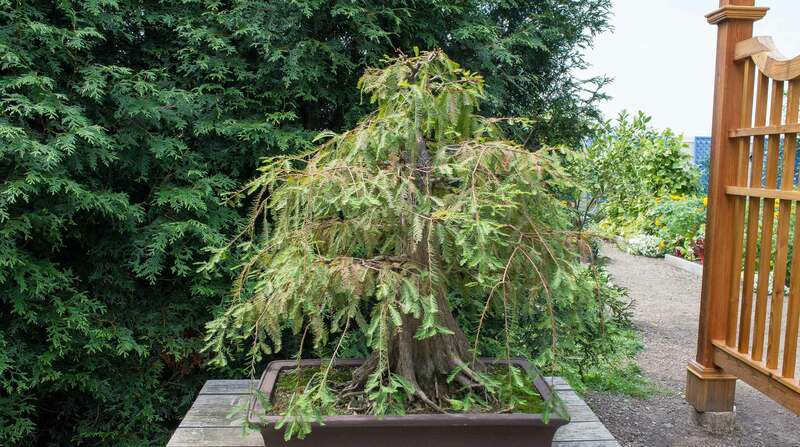 are among the less-common species to be found eastern U.S. bonsai collections. Our two silverberries are shaped in the slanted style and have a lovely silver sheen that sets them apart from other plants in the collection. Weeping figs (Ficus benjamina) are probably the most commonly used tropical bonsai trees today. We have many forms and sizes of this species, including a forest form, pictured here, created by the late John Naka, the father of American bonsai. Natal plum (Carissa microcarpa) ) is a fine example of a “weeping cascade” and bears beautiful white flowers that have a sweet fragrance. Lacking its native pollinator, a nocturnal insect from South Africa, our specimen rarely produces fruit. The Japanese mock-orange (Pittosporum tobira) appears in a few different forms in our collection. 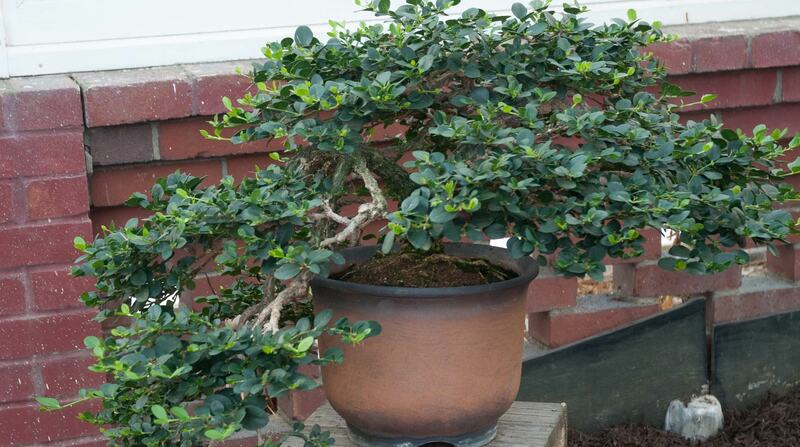 The “informal upright” specimen is our best example of the plant’s traditional appearance in Japanese bonsai. The waxy leaves of the mock-orange distinguish it from other trees, and when matched with the right container, it can be quite eye-catching. 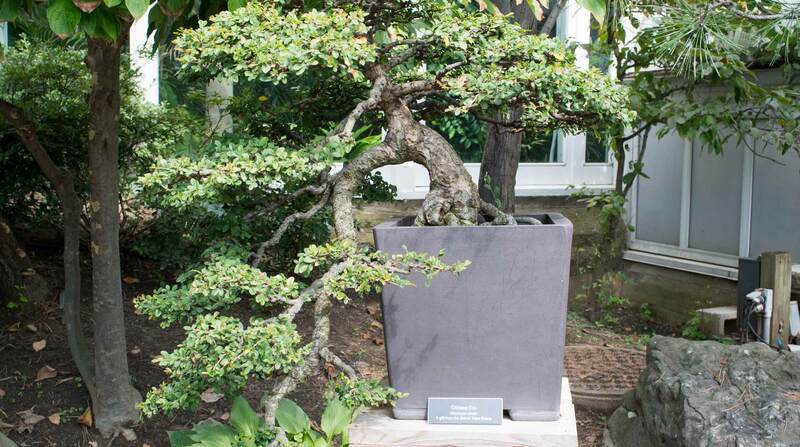 Chinese elm (Ulmus parvifolia), a traditional bonsai species, is native both to the birthplace of the art of bonsai, China, and to the country that popularized the art, Japan. 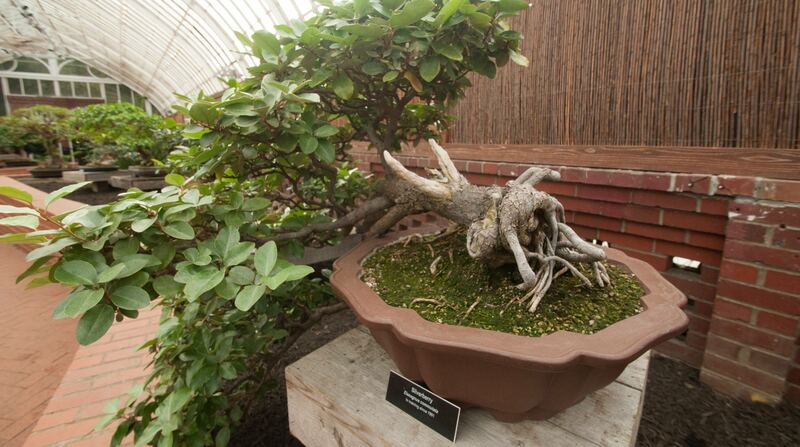 Our collection includes many forms of this bonsai, from slanting to cascade. We have many forms of the Japanese white pine (Pinus parviflora) in our collection; a favorite among staff is a forest form in an eggshell-shaped container, which serves as an example of how the right pot selection can make one bonsai stand out among many. Bald cypress (Taxodium distichum) is growing in popularity among the bonsai community and makes an outstanding example of the formal upright form. With two of these in our collection, we allow visitors to see in miniature all the features of the full-sized tree, found in the swamps of the American south. Deserts are found on every continent on Earth. Some are hot, and others are cold, but all are characterized by very low annual rainfall. Our collection focuses on the hot deserts of the world. Plants native to these regions have evolved a variety of adaptations in order to survive in their harsh environment. The Joshua tree (Yucca brevifolia), native to the Mojave Desert, is a slow growing yucca. A mature Joshua tree may grow only an inch and a half annually. Like only a handful of other plants, the Joshua tree is namesake to a U.S. national park. The saguaro (Carnegiea gigantea) is native to the Sonoran desert. 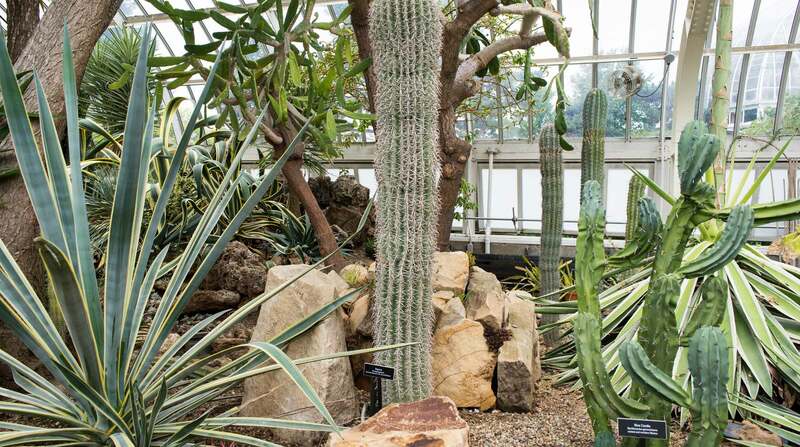 When mature it is the second largest cacti in the world, with some specimens reaching heights of 50 feet. At just five feet tall currently, our specimen is a mere toddler. The flower of the saguaro is the state flower of Arizona. Palo verde, Spanish for “green stick,” refers to any of four species of the flowering plant genus Parkinsonia or their hybrids. Our palo verde is a hybrid called Sonoran Emerald. Palo verde trees are characterized by their green trunks and branches, which allow them to continue performing photosynthesis even in the hottest months of the summer when they have dropped their small leaves. The bright red color of fire barrels (Ferocactus cylindraceus), native to the southwestern U.S., is truly a sight to behold. 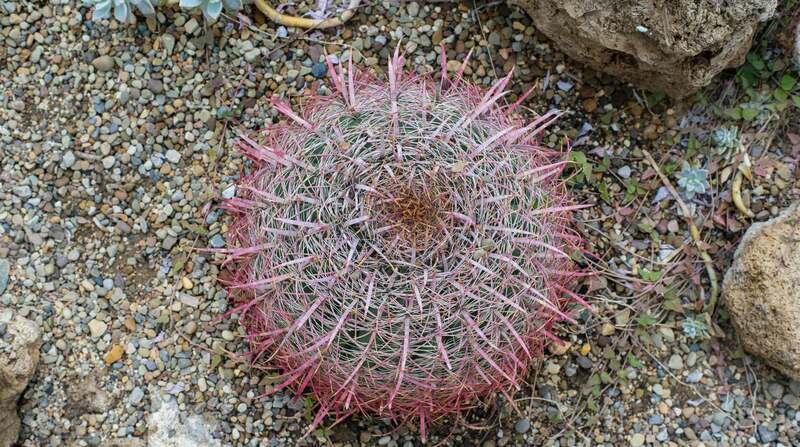 Sometimes called compass cacti, fire barrels will grow faster on their shady side, causing them to tilt to the south. Cape aloe (Aloe ferox), native to the Cape region of South Africa, is used in a variety of products, from cosmetics to medicine. 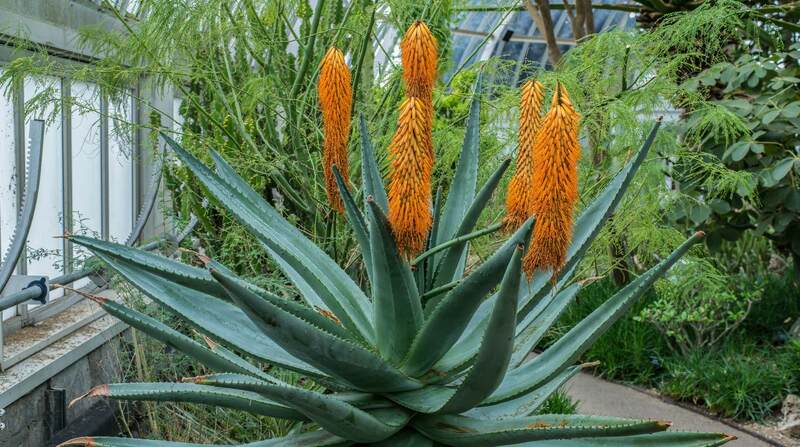 Our Cape aloe is a fully mature specimen that produces copious orange flowers when in bloom. The tortoise shell plant (Dioscorea macrostachya) belongs to the yam family. 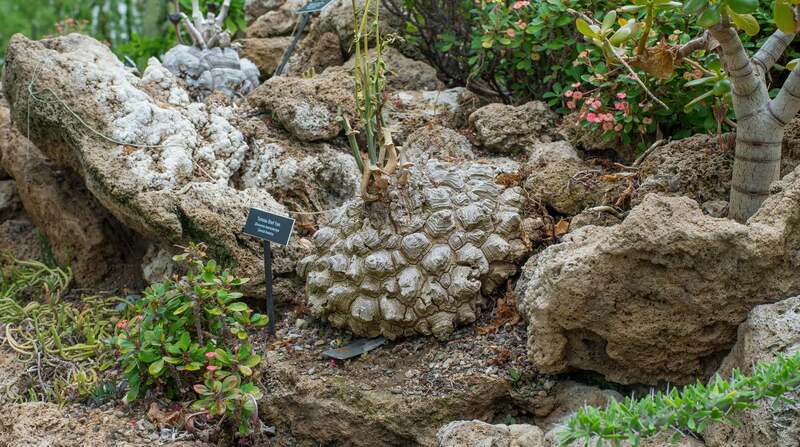 Its name derives from the tortoise-like appearance of its caudex, the basal stem structure where new growth occurs. The Bushman poison bulb (Boophane disticha) is native to much of the dry regions of southern Africa. Its name derives from its use in the poisoning of arrow heads among various tribes of the area. 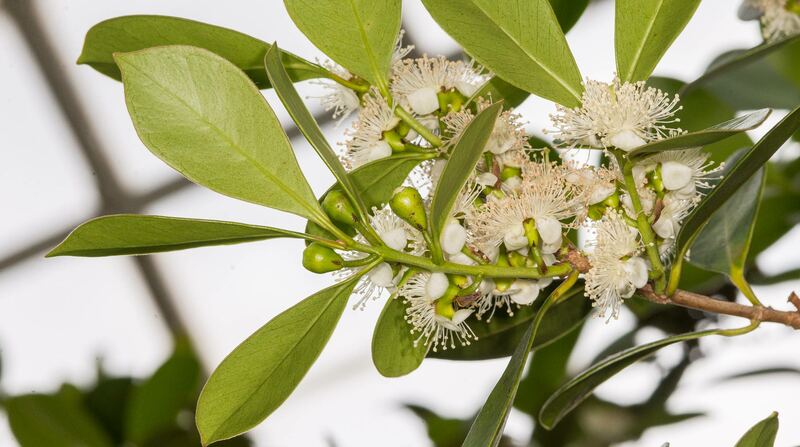 The Bushman blooms every year prior to producing leaves, unfurling a bloom that is almost a foot across when fully open. Hailing from the deserts of Namibia, the African tree grape (Cyphostemma juttae) is a desert ephemeral, undergoing quick growth spurts followed by long periods of dormancy. 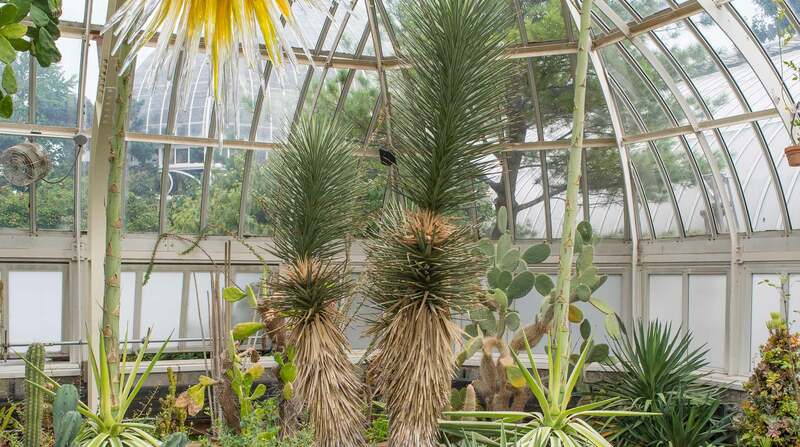 The plant achieved fame at Phipps through our popular “I’m not dead, I’m dormant” tee shirt. The sunrise tequila agave (Agave tequilana 'sunrise'), native to Mexico, is a variegated form of the plant grown to produce tequila. Like all agaves it will grow for many years before producing a flower spike. The shaving brush tree (Pseudobombax ellipticum) loses its leaves in the dry winter months and then blooms in spring before the leaves have developed. 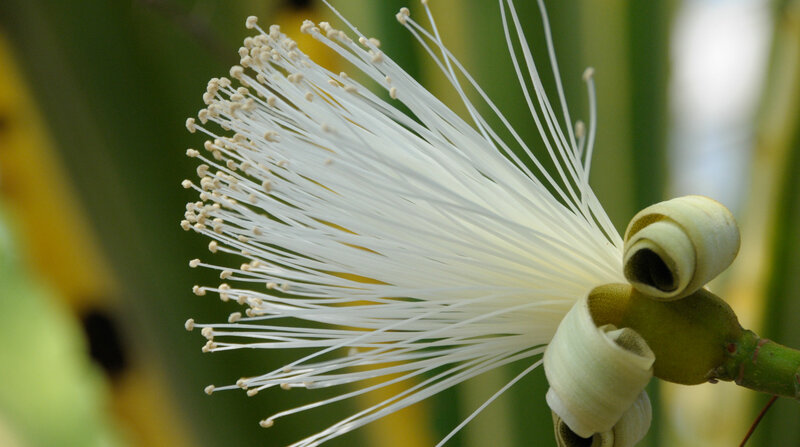 The flowers of the tree, which may be either pink or white (ours are white), resemble an old-fashioned shaving brush. 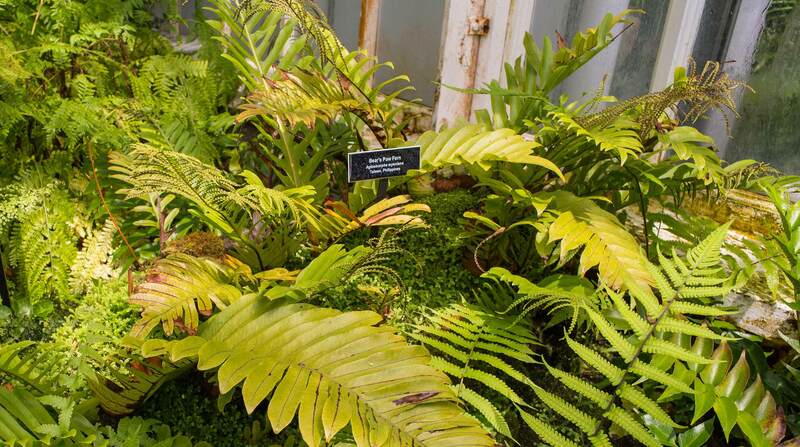 Our Fern Room houses a profusion of tropical and subtropical ferns (pteridophyta) and gymnosperms. 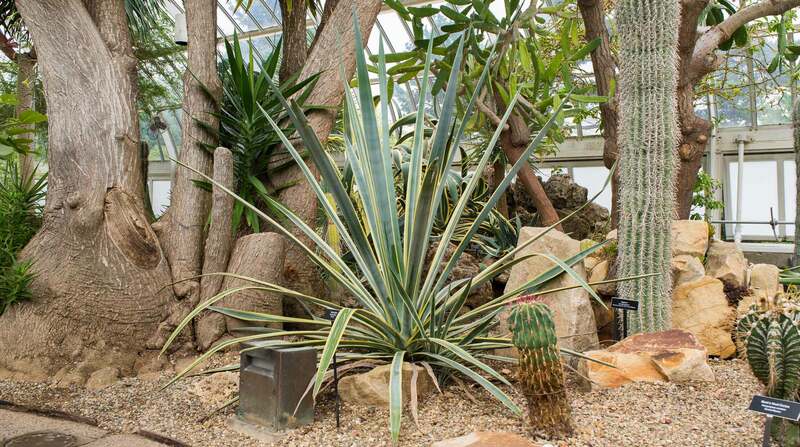 Plants belonging to these two groups, among the oldest of all vascular plants on Earth, reproduce without flowering. Ferns reproduce sexually through spores and asexually through divisions and rhizomes. 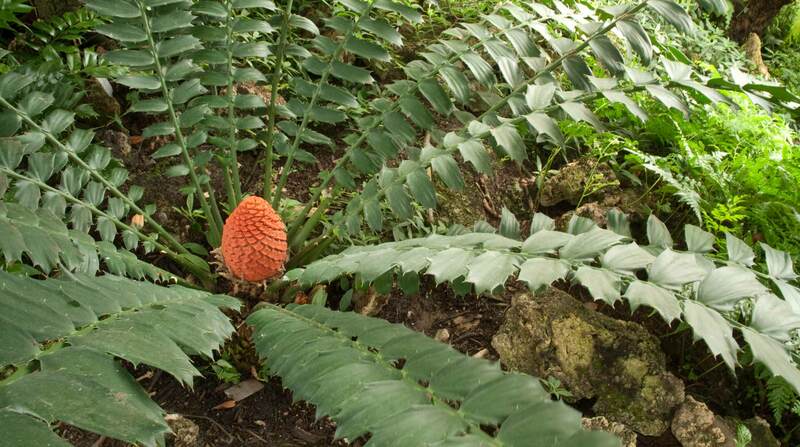 Gymnosperms, a group including conifers and cycads, reproduce through unenclosed or “naked” seeds. 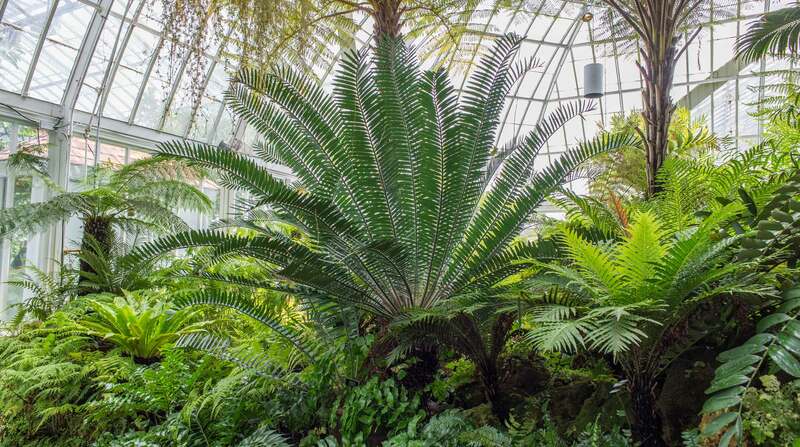 The Munch’s cycad (Encephalartos munchii) is native to Mozambique and parts of northeastern South Africa. The species is classified as critically endangered on the International Union for Conservation of Nature’s Red List. Experts believe that less than 250 of these plants still exist in the wild. By caring for this plant in a human-controlled environment, Phipps is engaging in ex situ (offsite) conservation. Like all Encephalartos species, the Eastern Cape cycad (Encephalartos altensteinii), has a very slow growth rate, growing only about two centimeters per year. Wild specimens of this plant, which is native to the Cape region of South Africa, have been over-collected. The species is classified as venerable on the IUCN Red List. Our specimen is one of the finest in a public collection. 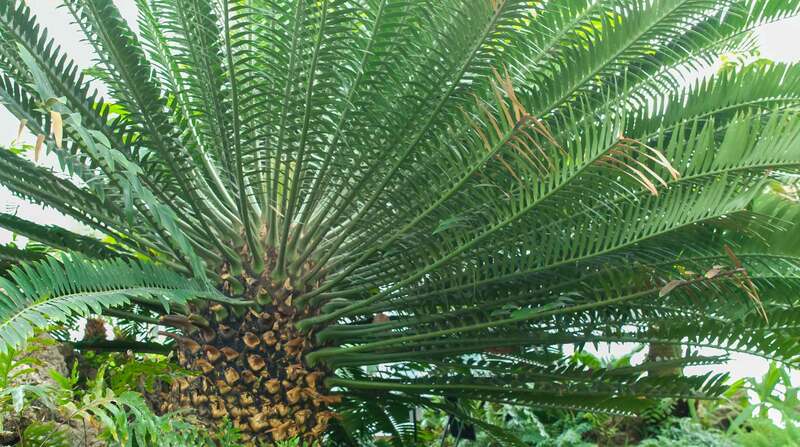 The Zululand cycad (Encephalartos ferox) is near-threatened with populations declining in its native habitat of Mozambique and South Africa. At Phipps this cycad is a favorite among staff and guests for the large red strobilus (cone) the size of a football it produces every five or six years. All cycads are dioecious, meaning that individual plants are either male or female. Our Zululand is a female. 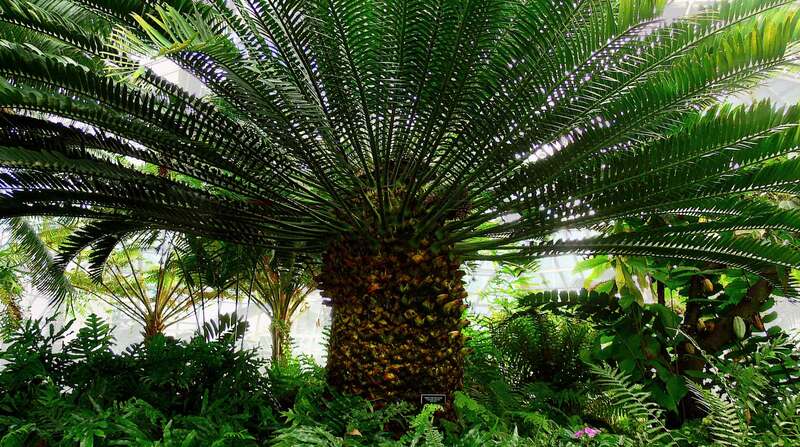 The queen sago (Cycas circinalis), the largest of our cycads, might be mistaken for a palm tree. The species is endangered in its native range in southern India, but due to its introduction into other regions and its prominent use in landscapes, the issue of its conservation is not considered urgent. 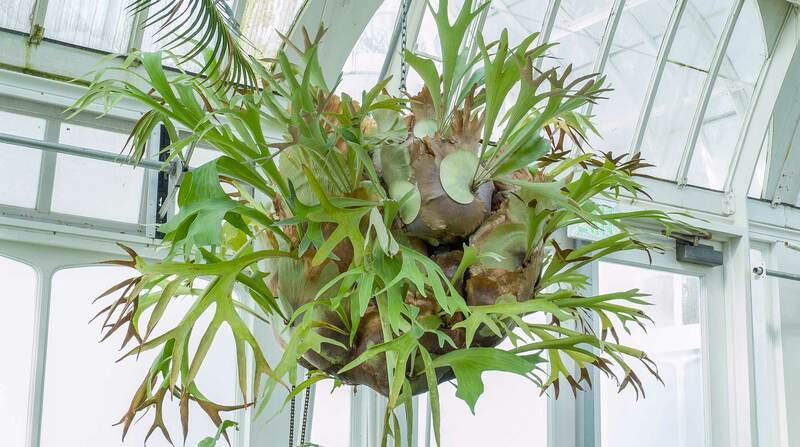 Staghorn ferns (Platycerium bifurcatum) have a wide distribution ranging from Australia to New Guinea. 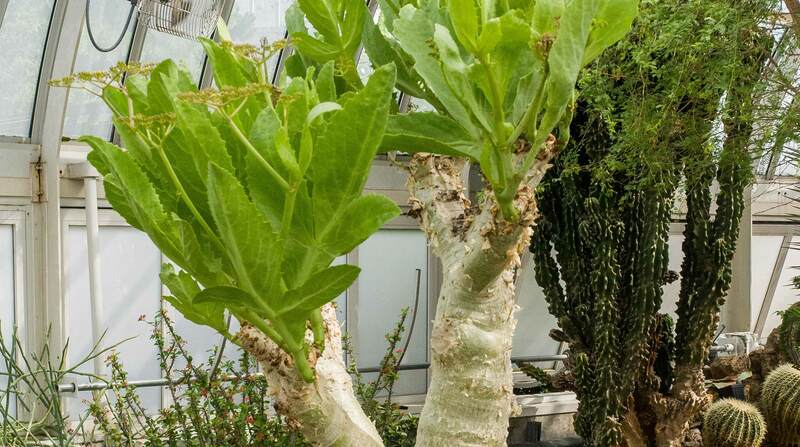 This epiphyte (a plant that derives its moisture and nutrients from the air and rain) produces long, horn-like leaves. Our specimen, situated in a hanging basket, has grown entirely around its support and appears to be floating in the air. The Australian tree fern (Cyathea cooperi) is one of the more common tree ferns in botanical gardens due to its fast growth and tolerance of many soil types. Unfortunately, these characteristics make the plant invasive in many tropical regions where it is introduced (though it is not an invasion risk here, thanks to our harsh winters). 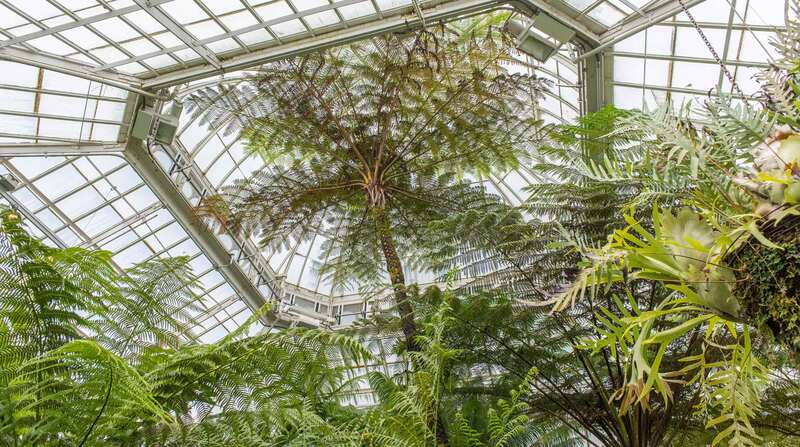 The tallest of all the plants in the Fern Room, the Australian tree fern imbues the space with a certain prehistoric majesty. 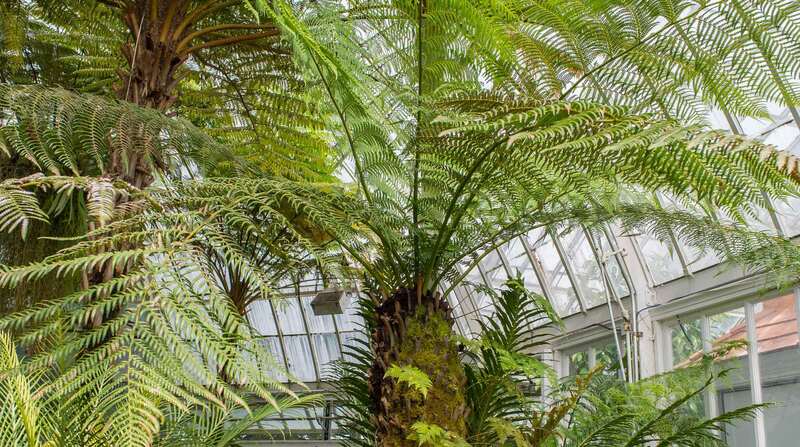 Tasmanian tree ferns (Dicksonia antarctica), also abundant in our Fern Room, are much smaller than the Australian tree fern due to their slow growth rate. This species is known for hosting many epiphytes and mosses, which cling to its stem. Two varieties of tongue fern (Pyrrosia lingua and P. lingua ‘cristata’) are hanging from the rafters in our Fern Room epiphytically, but the species can also grow terrestrially. This species hails from eastern Asia, and specimens are common in Japanese gardens. Pictured here is Pyrrosia lingua. The bear’s paw fern (Aglomorpha meyeniana), native to the Philippines, is named for the fuzzy, paw-like rhizomes at its base. It makes an excellent houseplant due to its tolerance for a variety of conditions. Our specimen is growing on tufa rock near the entrance to the Orchid Room. The rabbit’s foot fern (Davallia fejeensis), native to the Pacific Islands, has some of the most beautiful fronds of any fern. 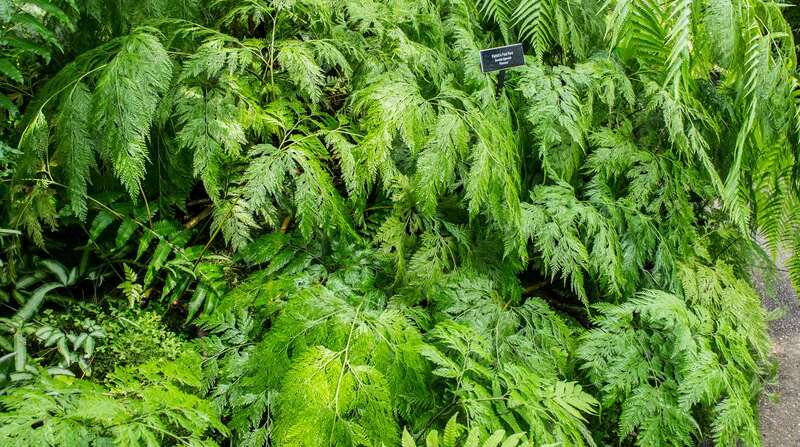 Its lacy appearance makes it stand out in an understory planting, as it is found in our Fern Room. The plant’s fuzzy, foot-like rhizomes will spread as it grows. While you may recognize many of our Tropical Fruit and Spice Room plants due to the common products they produce (think bananas and coffee) here are some that are a bit more exotic. Miracle fruit (Synsepalum dulcificum) is native to western Africa. Its small, red fruit, which becomes ripe in the fall, has unusual an effect when consumed: A protein called miraculin binds to receptors in the mouth, making sour foods taste sweet (for instance, lemons taste like lemonade, and tamarind tastes like taffy). Lychee (Litchi chinensi), native to China, is a relatively small tree, with mature specimens typically reaching heights of only 50 feet or so. The fruit has a prickly outer shell and an edible, white, gelatinous flesh rich in potassium and vitamin C.
The allspice plant (Pimenta dioica), native to Central America and parts of the Caribbean, is the source of the seasoning allspice (which is not, as its name might suggest, a mixture of spices). The seeds of the Pimenta dioica are ground to create the spice, which features prominently in Jamaican “jerk” recipes. Phipps has two allspice trees, one specimen of the common variety and one lemon-scented cultivar. Prickly apple (Annona muricata) also called soursop, bears one of the stranger-looking fruits found in this collection. Native to Central and South America, the prickly apple is related to our native paw paw tree. 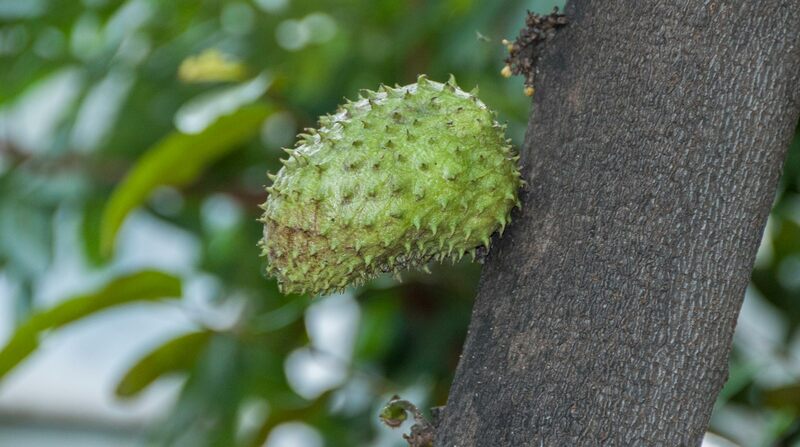 Its fruit has a prickly outer shell, a slimy texture and an abundance of seeds but boasts a flavor reminiscent of banana, pineapple and mango. The pomelo (Citrus maxima) is native to southeast Asia. 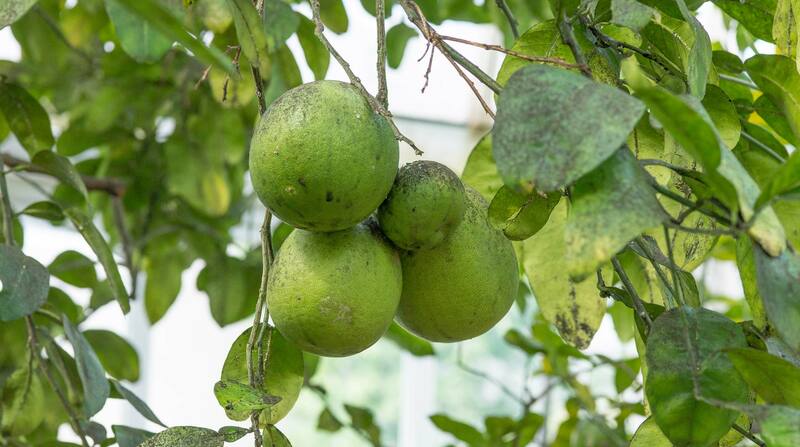 Its fruit, the largest of all citrus fruits and the largest fruit of any kind in our Tropical Fruit and Spice Room, resembles a grapefruit in appearance and flavor. In fact, it is believed that the grapefruit is a hybrid of the pomelo and the orange. The dragon fruit (Hylocereus undatus), a type of cactus, is one of the newer additions to our Tropical Fruit and Spice Room. 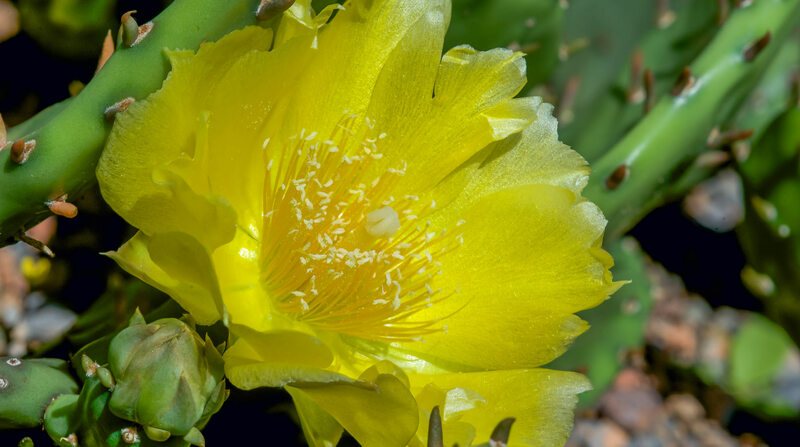 Like all cacti, it is native to the western hemisphere, but it is also now grown worldwide. Like many cacti, it is a night bloomer. Although currently still small, our specimen will soon attach itself to the wall and start climbing. We expect it to begin producing fruit in 2015 – 2016. Dragon fruits are very colorful, with large, spiky scales and a flavor similar to kiwi. Somewhat unusually for a fruit tree, the loquat (Eriobotrya japonica) flowers in the fall, with fruit ripening by the end of winter. An evergreen with fragrant flowers, the loquat is used as an ornamental in subtropic regions. China, the loquat’s native range, boasts hundreds of varieties that are used both for food and for medicinal purposes. Our tree has a very attractive exposed root system that radiates in all directions. There are nearly 100 species of guavas (Psidium spp. ); Phipps has specimens of two. Guavas are native to the Americas but are now cultivated and naturalized worldwide. Though of unassuming appearance when hanging on the tree, guava fruits reveal a rainbow of colors when sliced open. The bright pigments indicate the fruit’s high levels of antioxidants and vitamins. Guava can be eaten raw or made into jellies. A slow-growing tree, jaboticaba (Myriciaria cauliflora) can produce fruit year-round if conditions are right. Its fruit is cauliflorus, growing directly from the trunk (rather than at the branch extremities, as on most fruit trees). Resembling large grapes, the fruits may grow by the hundreds or even thousands on the trunk of a mature tree. 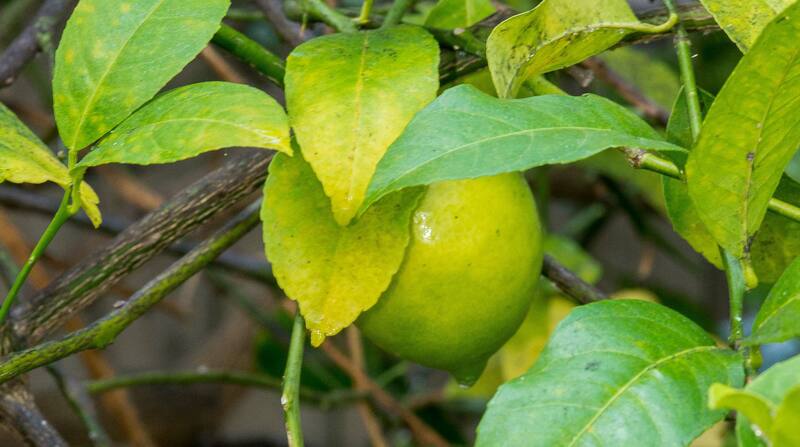 Meyer lemons (Citrus × meyeri) are some of the easiest citrus trees to grow. Due to the hybrid’s long history of cultivation in China and other south Asian countries, its origin cannot be definitively identified, but it is likely a cross between a lemon and a mandarin orange. Our Center for Sustainable Landscapes features plants native to the region around Pittsburgh. By choosing native plants instead of exotic ones, gardeners can avoid introducing potentially invasive species. 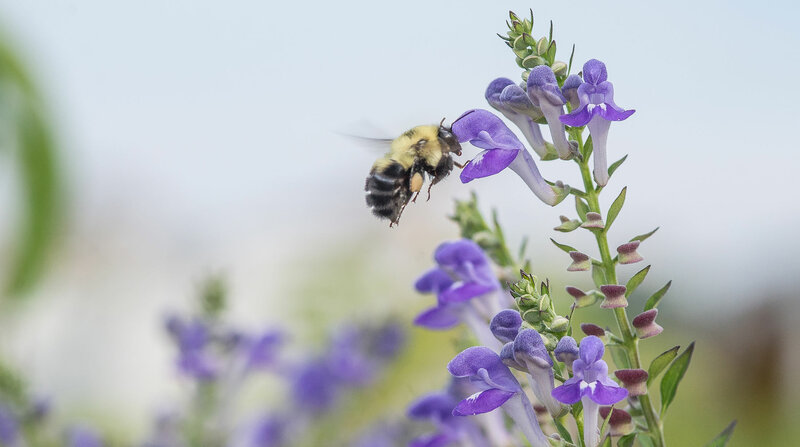 And, because native plants are adapted to their surroundings, they require little to no watering, fertilizers and pesticides to thrive, making them a boon to sustainable landscaping. Additionally, many of these plants even have medicinal uses. 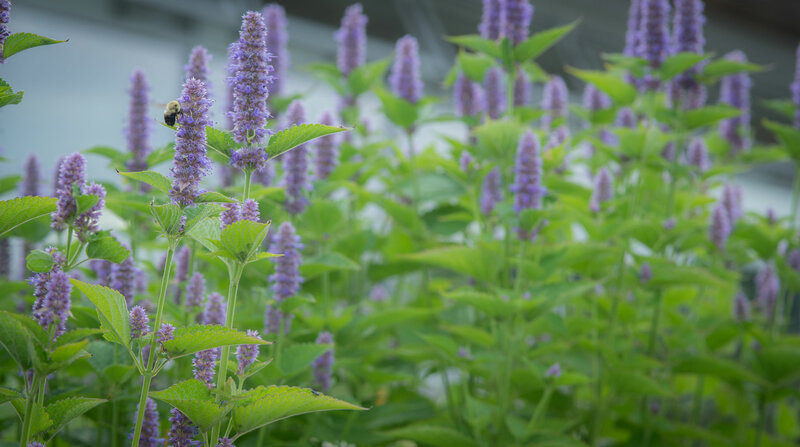 Giant hyssop (Agastache foeniculum) is accustomed to dry seasons and thrives in full or partial sun. Its leaves can be eaten or made into herbal tea, and its seeds, which taste similar to anise or licorice, can be used to flavor foods. Giant hyssop attracts hummingbirds and butterflies and serves as a food source for migratory birds. 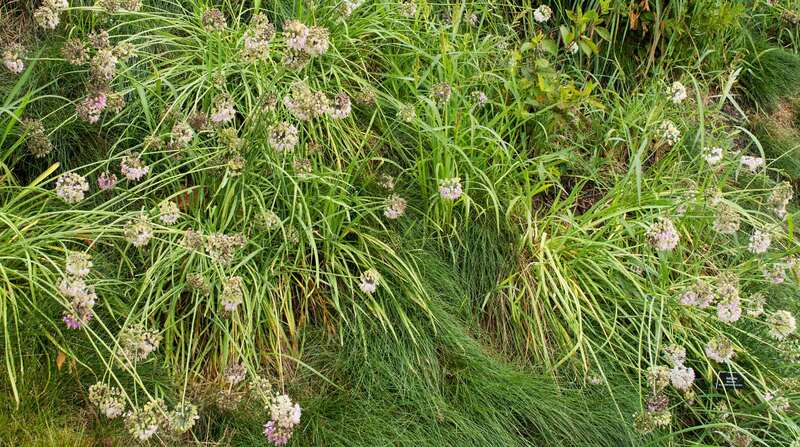 Nodding onion (Allium cernuum) is edible raw or cooked and relieves respiratory ailments. Its juice can be used as an insect repellant. Nodding onion blooms in the summer and is propagated by seeds. Nodding onion readily reseeds, so if this is not desired, flowers should be removed as they fade. 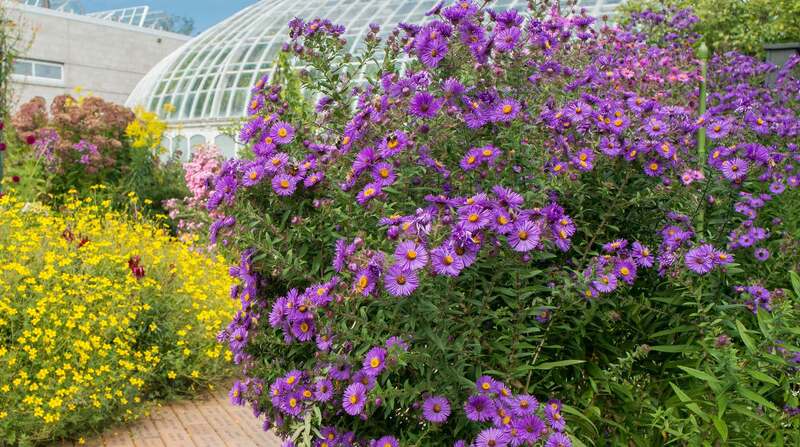 New England aster (Symphyotrichum novae-angliae ‘Vibrant Dome’) performs best under full sun. Among the plant's various medicinal applications, the root can be used as an analgesic, astringent, expectorant or febrifuge, and the leaf can be rolled into a poultice for pain, fevers and diarrhea. The flower buds should be pinched back in early summer to promote greater flowering in the fall. Eastern prickly pear (Opuntia humifusa) is a native cactus. It prefers full sun and dry, rocky/sandy soil that is well drained. The fruit is edible and very sweet. Eastern prickly pear blooms for one month in the summer, and each individual flower lasts only one day. The plants can be propagated easily by planting the pads. Hoary skullcap (Scutellaria incana) is a member of the mint family. It thrives in both full sun and shade and can tolerate wet to dry soils. The leaves and flowers are used medicinally to treat mild inflammation and nervous conditions. Hoary skullcap is also a sedative and can be used in calming teas. Bearberry (Arctostaphylos uva-ursi), a close relative to the blueberry, is a winter-hardy shrub that prefers full sun and performs best in well-drained, acidic soils. The fruit is a vibrant red berry that can be used to treat urinary tract infections. American hazelnut (Corylus americana) is a small shrub that does well in full sun and medium to dry soils. The nuts, which are encased in leafy bracts, can be harvested in late summer and early fall. They can be eaten raw, roasted or ground into flour. 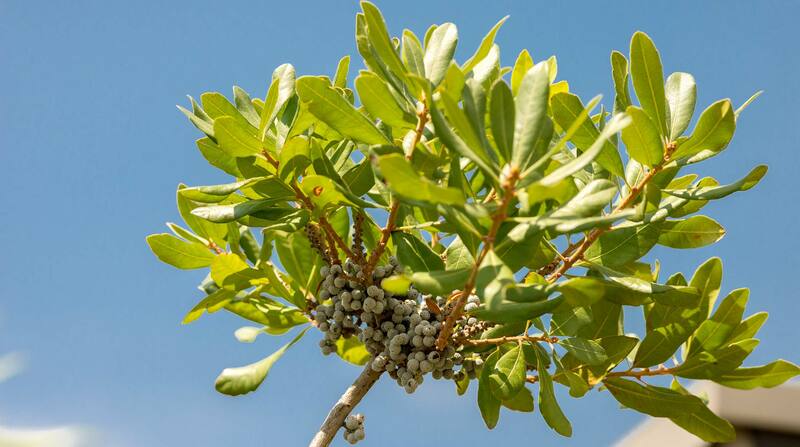 Bayberry (Myrica pensylvanica) is a medium-sized, semi-evergreen shrub that tolerates dry soils and full sun. Its inconspicuous flowers give way in summer to fragrant berries, used in potpourri and scented candles. Male and female plants should be planted in close proximity to ensure berry production. 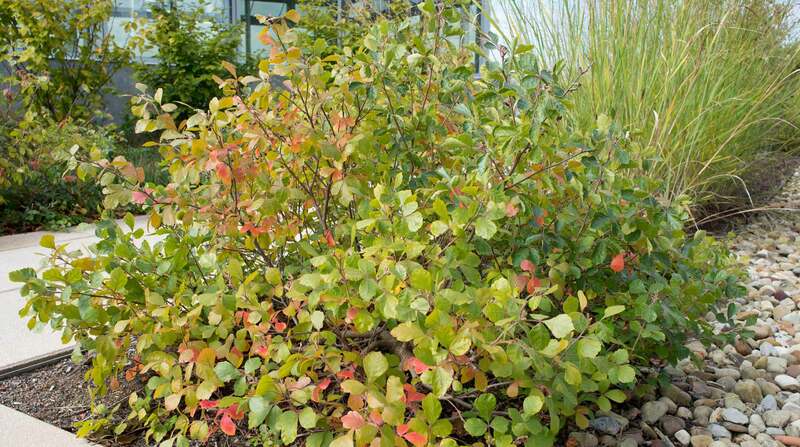 Fragrant sumac (Rhus aromatica) is a low-growing shrub that tolerates a variety of growing conditions. It will do well in sun and shade, dry and wet soils. The leaves have a citrus smell when crushed, and the bark was traditionally used in leather-tanning and basket weaving. Fragrant sumac has a brilliant red fall color and creates interest in the landscape in all four seasons. New Jersey tea (Ceanothus americanus) is a small shrub that thrives in full sun and medium to dry soils. It has a long lasting white bloom in the summer, and the twigs look yellow to red in the winter. The bark and leaves have been used to treat a variety of ailments, notably asthma, bronchitis and coughs. Our Outdoor and Discovery Gardens are great places for guests to get inspiration for their own homes. With both native and exotic plantings, these gardens have something for everyone. 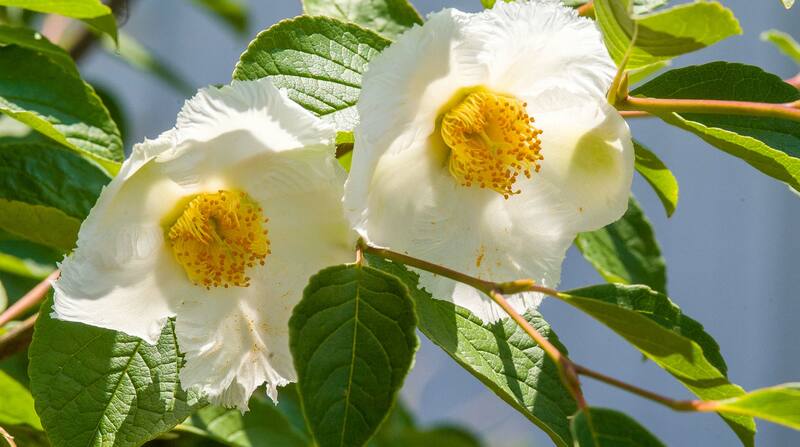 Japanese Stewartia (Stewartia pseudocamellia) is a member of the tea family. With bark in mottled autumnal colors (and, in June and July, blossoms resembling fried eggs), this is an eye-catching plant. Japanese Stewartia thrives in full sun to partial shade. Typically multi-stemmed, it grows to a height of 12 to 40 feet with a spread of eight to 25 feet. Jack in the pulpit (Arisaema triphyllum) is a woodland wildflower that gets its name from its unusual inflorescences. 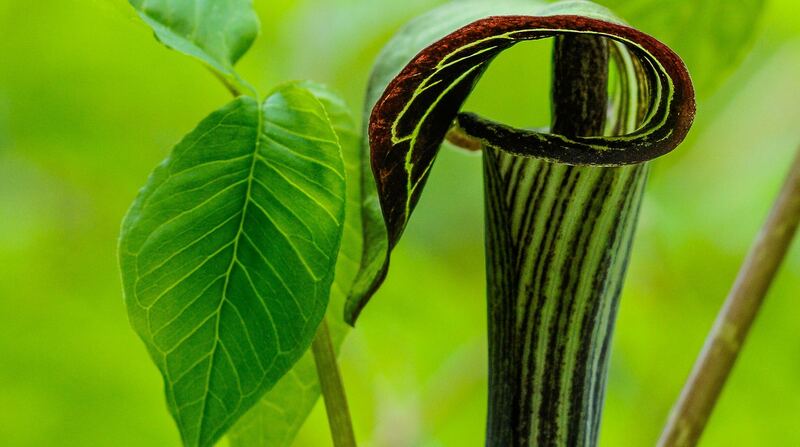 The bloom is composed of a “pulpit” (the spathe) that surrounds a “Jack” (the spadix) covered in many small green or purple flowers. The leaves and blooms disappear as spring ends, but a mature stake of red berries will remain until late summer. Jack in the pulpit’s tolerance of wet soil makes it a great plant for a rain garden. The fern leaf European beech tree (Fagus sylvatica ‘Asplenifolia’) looks grand with its finely pinnate leaves. The tree can grow to over 70 feet tall with a trunk circumference of nine feet or more and a crown spread of up to 59 feet. This is a tree to be planted for many generations to appreciate. The giant sentinel English Oak (Quercus robur var. fastigiata) commands the sky with its upright columnar stature. It will grow up to 60-plus feet tall but only up to 10 feet wide. 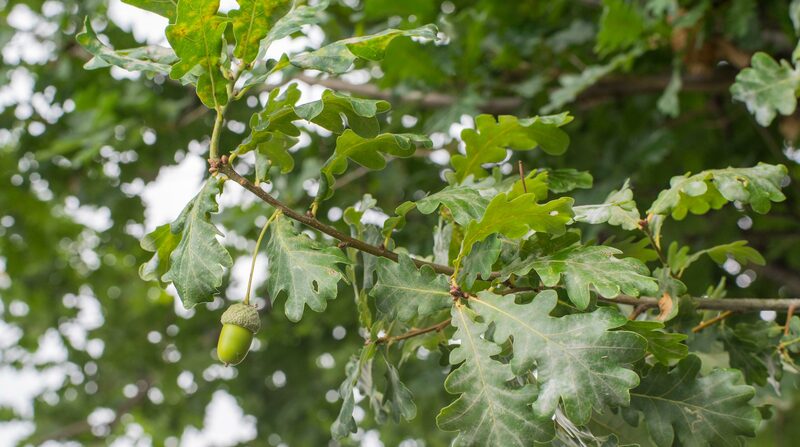 The English Oak can withstand many of the blights associated with street trees, making it an excellent choice for the urban landscape. The hardy begonia (Begonia grandis), native to China, flowers July through October with simple pink flowers above cordate leaves. It has a spreading habit and colonizes in partial to full shade. 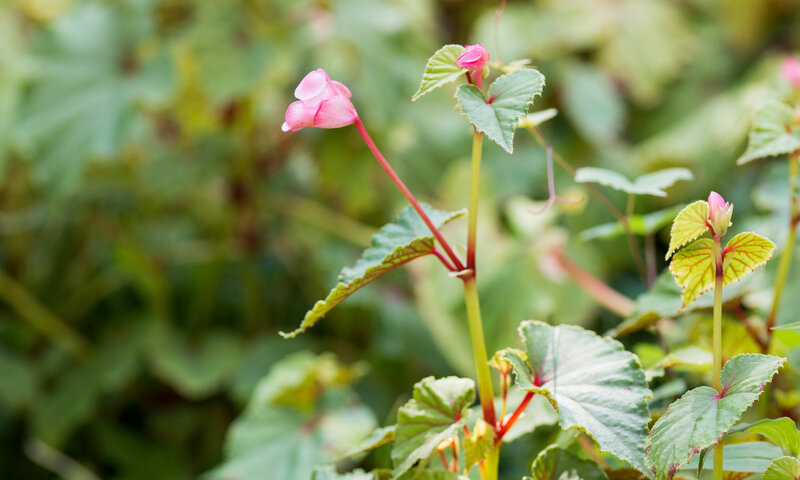 Hardy begonias mix well with other shade-loving plants and can tolerate walnut trees. The peegee hydrangea (Hydrangea paniculata ‘Chantilly lace’) can be grown in full sun. It gains a nice stature with large panicles that are white fading to pink. If the plant has a strong central trunk, it can be trained into a tree form. Pruning this type of hydrangea is not difficult and can be done at almost any time of year. 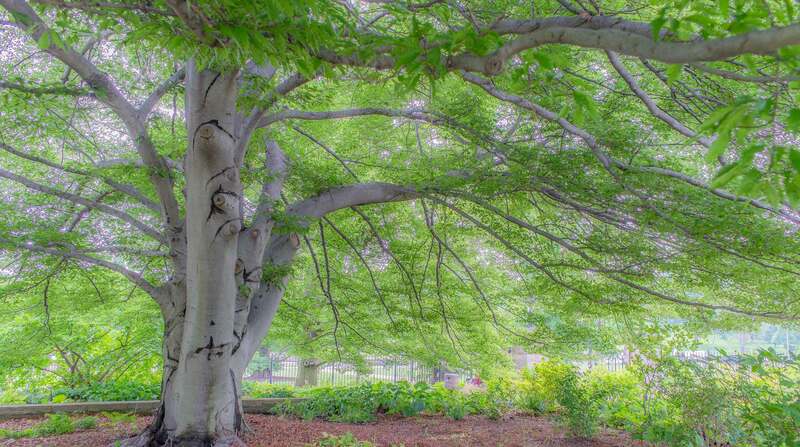 If you need a tree to grandly occupy a large space, the weeping beech (Fagus sylvatica ‘pendula’) is a great choice. It usually grows between 30 and 50 feet tall with an equal spread. In winter, the tree’s bare, twisted, fountain-like branches and silvery bark are striking. Although the blooms on the star magnolia (Magnolia stellata) are not fragrant, the petite star shapes are a welcoming sight in early spring. 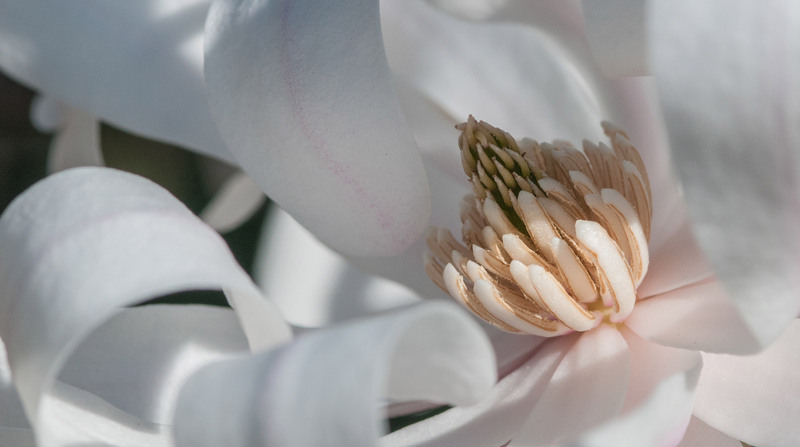 At 15 to 20 feet tall, this shrub/tree maintains a shorter presence than some other magnolias. The fruit is an attractive addition, and the bark is winter ornamental. The garden heliotrope (Valerian officinalis) has scented leaves, stems and flowers that release fragrance as the fine white flower heads pop up over lower-growing plants in spring to early summer. This perennial will relocate itself throughout the garden, adding a pleasant scent to the air. It lends itself to both medicinal and ornamental uses, including cut flowers. 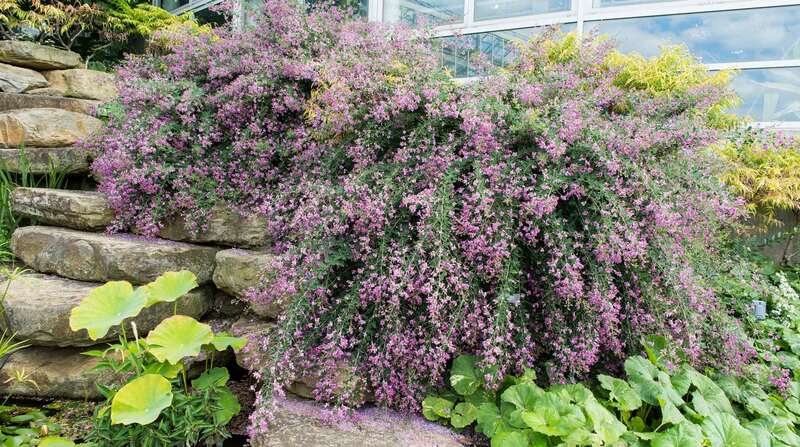 The bush clover (Lespedeza thunbergii) is a late-blooming, deciduous subshrub that creates a cascading visual effect and features pink, pea-like flowers from August through September. 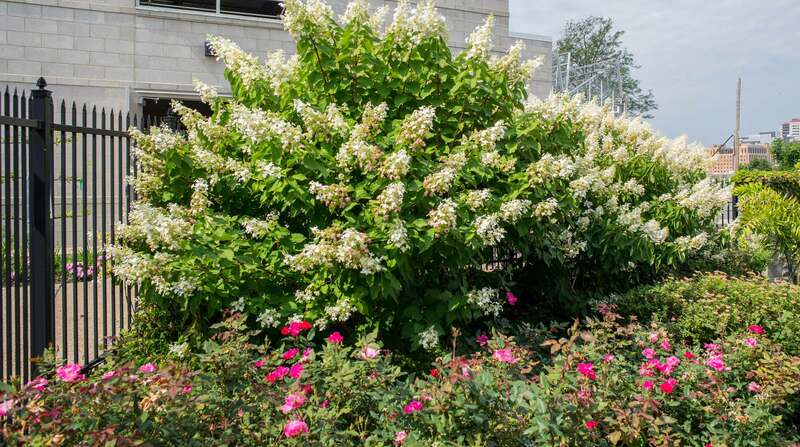 Since the bush can grow to be 3 – 6 feet by 3 – 8 feet, this beauty requires a lot of space in a late summer to fall garden. 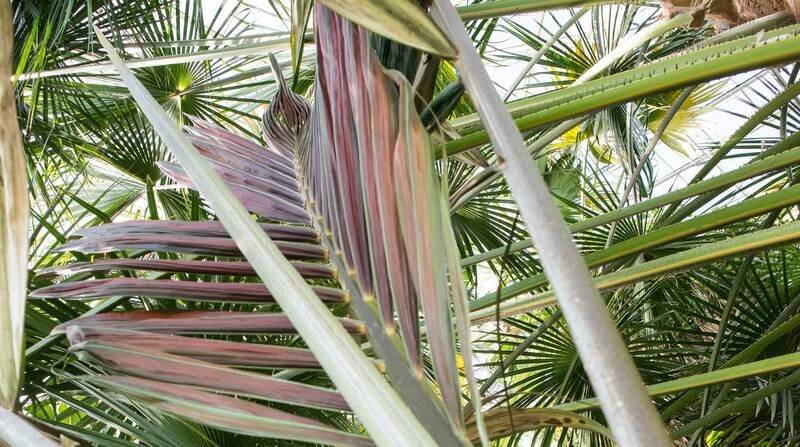 With nearly 2,600 distinct species and many more subspecies, the palm family encompasses a wide diversity of plants. While you will find the archetypical coconut palm at Phipps, our collection will also introduce you to a variety of less-common characters. The Bermuda palmetto palm (Sabal bermudana) is the only palm native to the island of Bermuda, where invasive plants have exerted increasing pressure on the species. A very salt-tolerant palm, the Bermuda palmetto is ideal for plantings on beachfronts and areas exposed to salt spray from the ocean. At about 35 feet, our specimen is approaching the maximum size for this species. 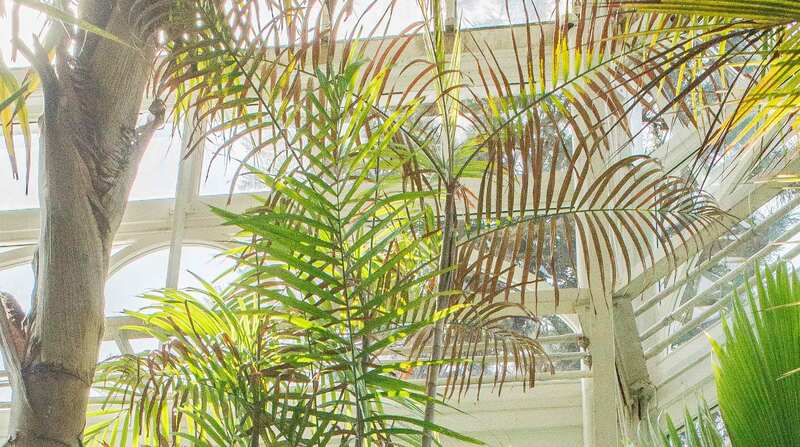 The triangle palm (Dypsis decaryi) derives its name from the triangular shape of its growth point, or meristem, from which its pinnate leaves emerge in three columns. With its yellow flowers and black fruit, the silvery sheen of its leaves and the mahogany sheen of its trunk, the tree is a striking ornamental. 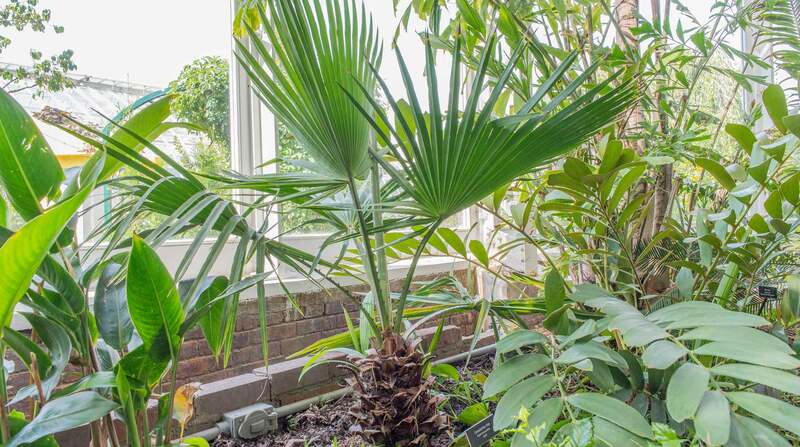 The triangle palm is considered a threatened species, with only about 1,000 specimens remaining in its native habitat of Madagascar, but its popularity as a landscape planting has bolstered numbers elsewhere. The açai palm (Euterpe olerace), native to Central and South America, has become highly sought-after for the nutritional benefit of its berries and for the heart of palm contained in its shoots. The harvesting of açai berries now serves as an income source for many Amazonians. Wax harvested from the carnuba wax palm (Copernicia prunifera) is commonly used in car waxes and dental floss. 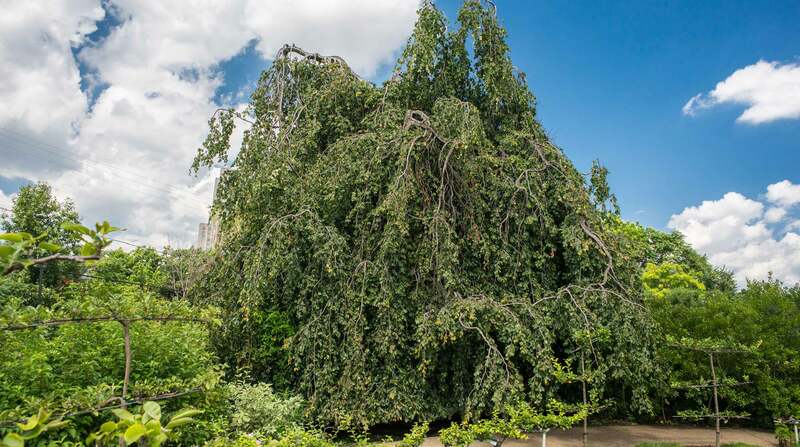 The tree can reach heights of 40 feet but is extremely slow growing. 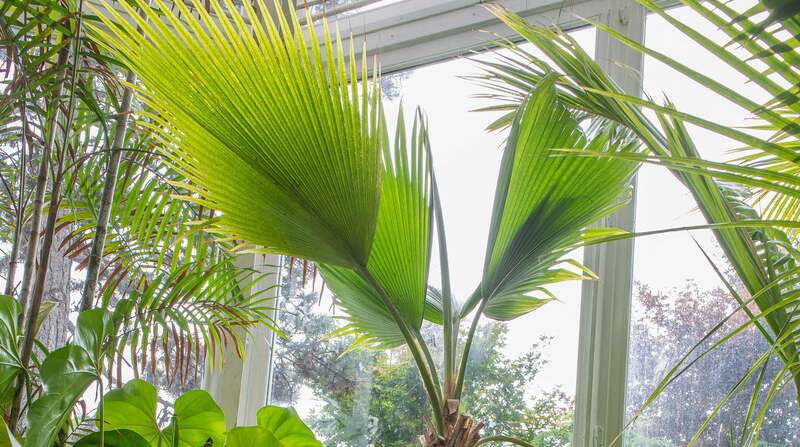 A new addition to Phipps’ palm collection, our carnuba specimen is still small. The Fiji fan palm (Pritchardia pacifica) is native to several islands of the South Pacific. The tree’s large, fan-shaped leaves can grow to approximately six feet wide and long, but its short petioles allow a slender profile that, paired with its great height, lend the tree a stately presence. Our Fiji fan is one of the tallest palms in our collection. 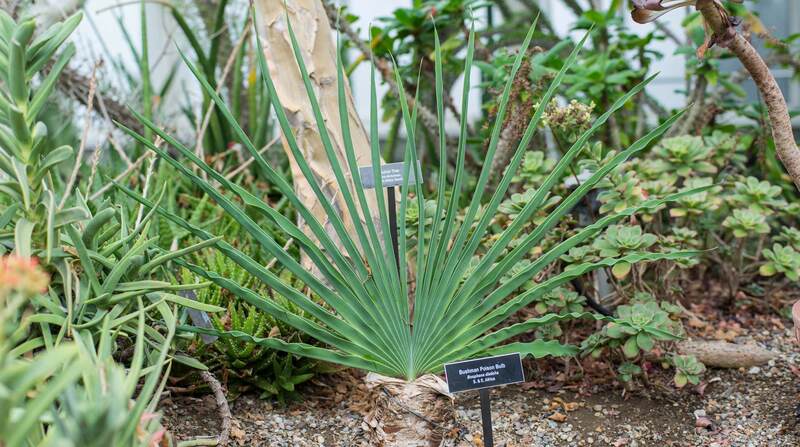 As its name implies, the Puerto Rican hat palm (Sabal causiarum) is used to make straw hats. The tree grows slowly but can reach heights of about 50 feet. Although native to Puerto Rico and other Caribbean islands, it has been reported to withstand temperatures as low as 19 degrees Fahrenheit. Flame thrower palms (Chambeyronia macrocarpa), native to the tropical island of New Caledonia, are striking trees, with leaves that emerge bright red before turning a dark green. Our specimen has proven more cold-sensitive than some of the current literature indicates, so during the coldest of winters, we must take extra care to safeguard it. The European fan palm (Chamaerops humilis) is the only palm native to Europe. Growing along the Mediterranean, it is unusually cold-hardy and has been reported to withstand temperatures as low as 20 degrees Fahrenheit. 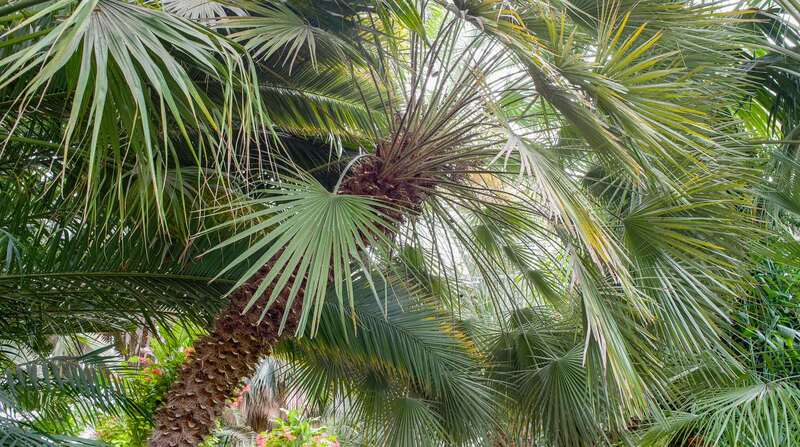 Thriving in drier soils, the European fan is commonly used in landscapes where other palms would dry out. This palm can be grown as a single stem or with multiple trunks, adding to its versatility as a landscape element. 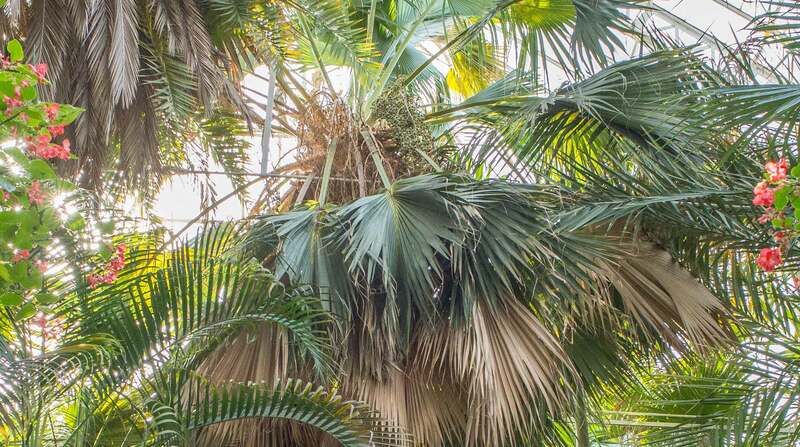 Talipot palms (Corypha umbraculifera), native to India, have the distinction of bearing the largest inflorescence (flower cluster) in the world. Producing the flowers consumes so much of the plant’s resources that each palm blooms only once before it dies. Our talipot palm is a newer addition to the collection, and it will be many years before we can expect to witness the spectacle of this blooming event.